We are Ladel Lewis and Bernadette Wright, the leadership team of Meaningful Evidence LLC and co-founders of ASK MATT and active on the Membership Committee of Washington Evaluators (WE), the AEA affiliate for the National Capitol Area. Like a great party needs guests, your organization needs members to succeed. Here are some example ways a membership committee can attract past, current, and future members. Recruitment: If you invite them, they will come! WE is planning a free membership celebration event where members bring future members. We also plan to extend an invitation to AEA members who are not WE members inviting them to join, using the AEA Affiliate Mailing List. We plug WE at the beginning of all WE events, then follow-up with attendees who aren’t members inviting them to join. Retention: Hey, stick around! Make it easier for members to be heard. WE added a half hour for informal socializing before board meetings (held at restaurants). Also, the Membership Committee makes welcome calls to new members monthly encouraging their participation and feedback. Reclamation: We miss you! When your organization is offering new services and benefits, some lapsed members may want to re-join. Keep them in the loop! Email, call, or send them a card encouraging them to come back. Hot Tip: One committee cannot do it all.Clarify with your Board each committee’s role. The WE board defined roles for three committees: Program, Membership, and Communications. We emailed members asking for volunteers to join these expanding committees. Hot Tip: Flexibility is key! Meeting at a regular day and time and incorporating technology can make it easier for people to attend. Based on asking Committee members how they would prefer to meet, the WE Membership Committee meets monthly by conference call. Hot Tip: Evaluation time! 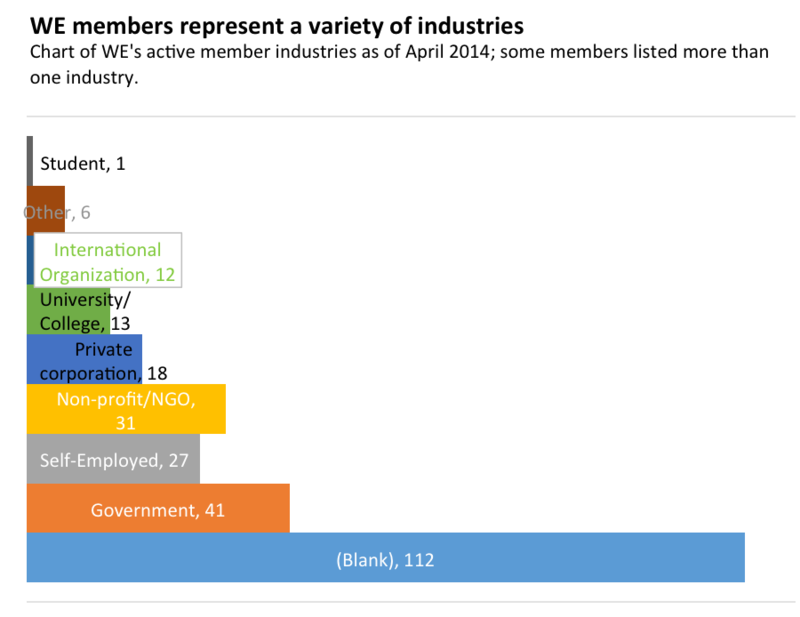 To understand trends and track our progress, the WE Membership Committee provides monthly statistics from our analysis of information in the membership database. Below is an example chart from our last report. Rad Resource: Membership management software makes it easier to manage membership data. WE uses Wild Apricot, a system that includes membership management, website content management, and email management. Rad Resource: Toastmasters Clubs are a great way to hone leadership and public speaking skills that you can use at any organization. Toastmasters provides training and a detailedClub Leadership Handbookfor all Club officers, including the Vice President Membership, who would create and oversee the Membership Committee. What has worked and what has not for membership building at your local evaluation association? Another Rad Resource: The AEA Local Affiliate Collaborative website provides resources for AEA local affiliates: http://www.lacaea.org/index.php?option=com_content&view=article&id=49&Itemid=56. These include resources that can help with membership, like “Affiliate Survey 2009 – Affiliate Strategies” and “Tip Sheet #1: Strategies to Recruit, Develop, and Sustain Affiliate Leaders”.